What a cute thing to see! A child's simple joy is amazing! Shelter Them volunteers gives a little girl a doll and brightened her day. She now has a home and everything else she and her family needs. Thank you for donating the dolls, they love them! A talented musician came with us! Great Country Singer-Songwriter and very compassionate human being! It is with pleasure to have Blair S Lane S Lane and Pamela C Lane join hashtag#Shelterthem mission trip 2018: Capturing the hearts of Country Music fans everywhere, with gripping lyrics and soaring melodies his music emotionally connects making you an instant fan. Meet Eileen Wilson-Marshall from Canada and Pamela from Rwanda: Eileen is going to hashtag#visitrwanda with hashtag#Shelterthem to meet her sponsor child Pamela for the first time. I can’t wait to see these two finally meeting and getting to know each in person. Pamela has a home, goes to school and she sees a bright future because someone like Eileen is donating $40.00 a month. I know for sure that Eileen’s life has been changed because of what she does. Kindness is good for everyone! More children to sponsor and stories: www.shelterthem.com Be a part of us! 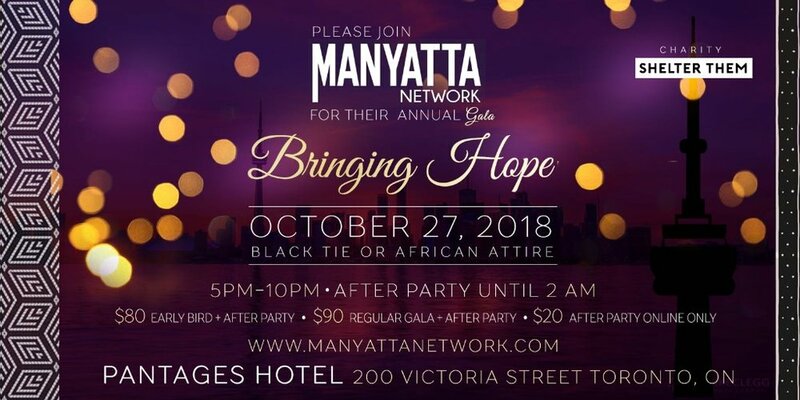 We are so excited that the Manyatta Network has chosen to support us during their 2018 Gala. Visit them and see what they do and how you can be involved or how to join the great Gala. The 2018 Stone Jug gala in Newfoundland was amazing! Great people, great food and an amazing cause.